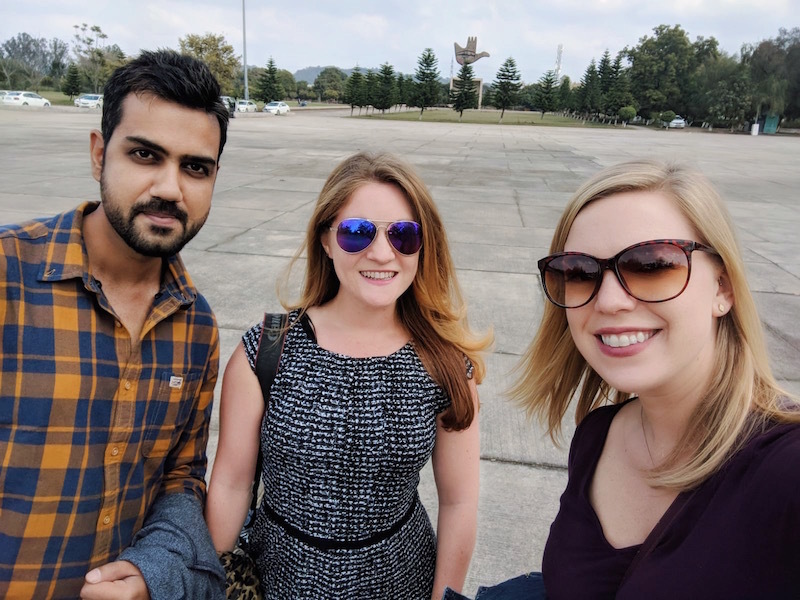 I didn’t spend 12 days in Varanasi, only 3. 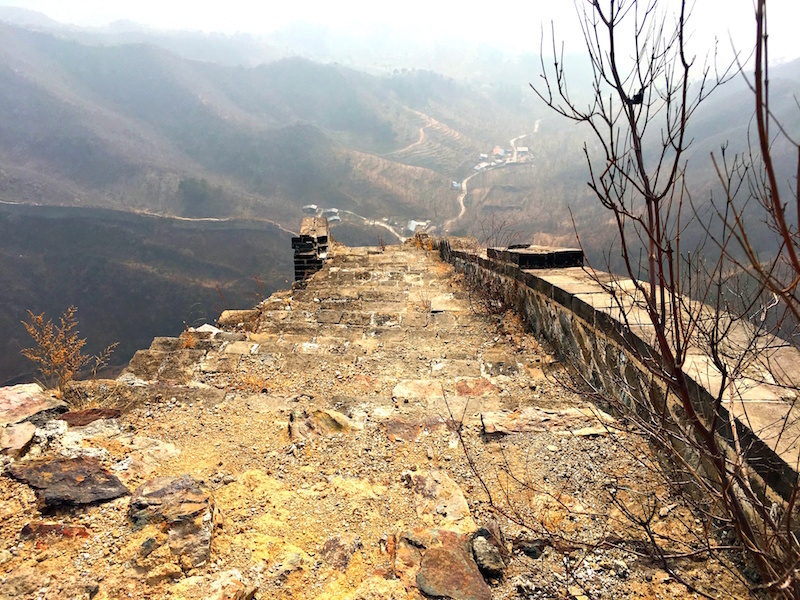 But it was a pretty amazing place; one of my favorites in India for sure. I mostly just wandered around taking photos. I wanted to post the photos of “daily life” in the religious city. 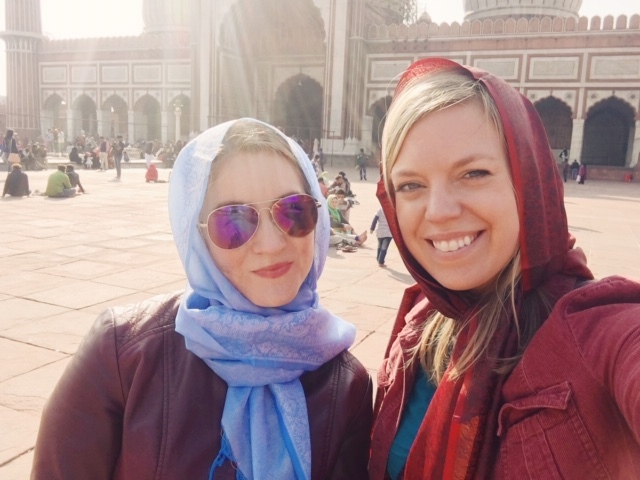 It’s probably the pain killers, but I decided writing about Varanasi would be more fun to the tune of “Twelve Days of Christmas.” So bare with me…. Obviously not just 12. Many, many more than twelve. 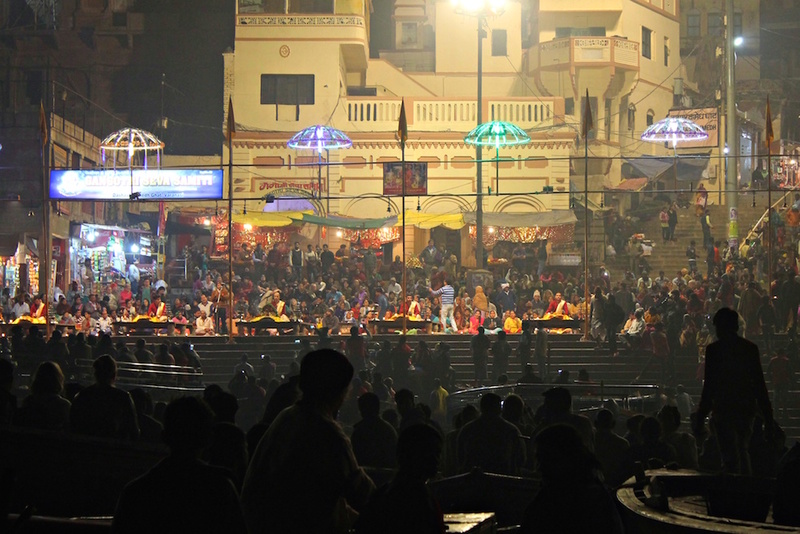 The evening Aarti at Dashashwamedh Ghat is attended by thousands. We were on the boat and could barely see through all the boats. Then another crowd comes by foot and observes from the ghat. The Aarti is performed by seven priests who commit to the Lord Shiva, Mata Gange, Surya, Agni (Fire), as well as the whole universe made by the Lord Shiva. 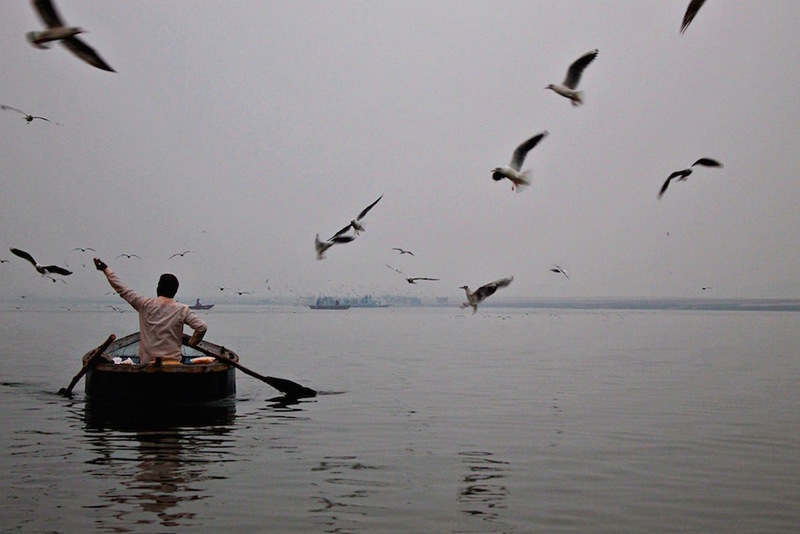 Early morning on the Ganges, a man feeds the birds. 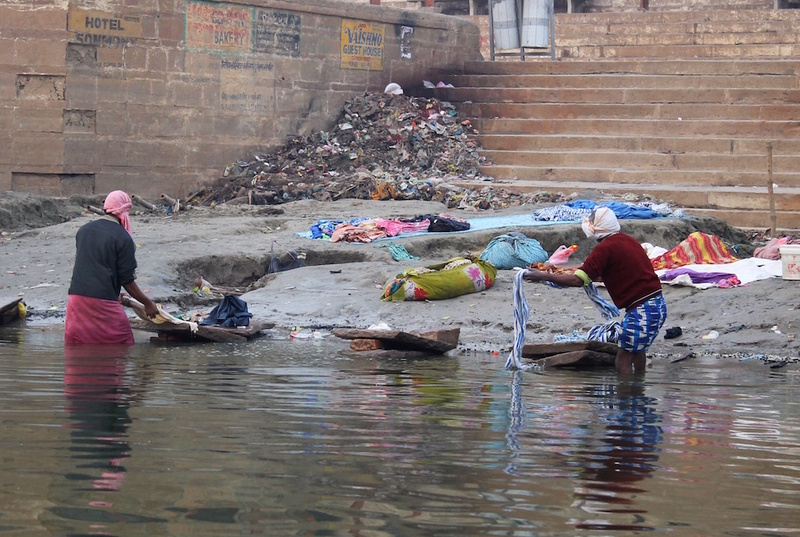 The Ganges is probably most famous for its bathers. Changing rooms dot the ghats. 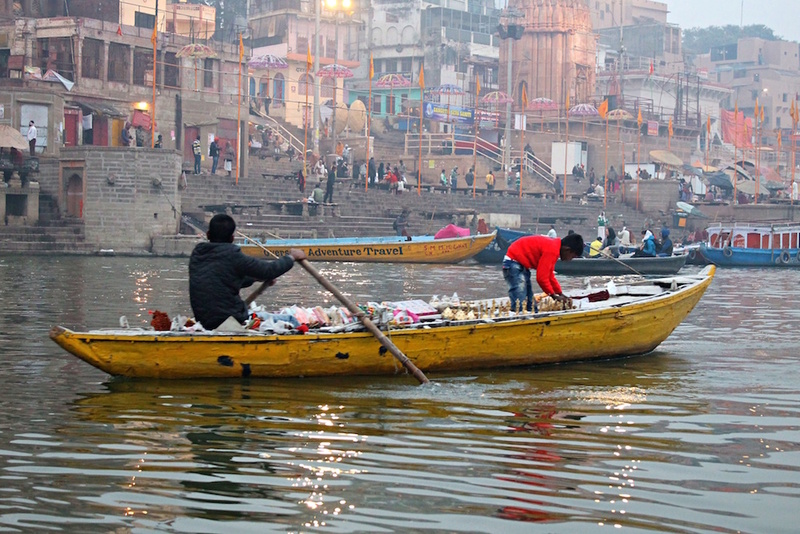 The river is considered sacred and the water is used in rituals and for purification. 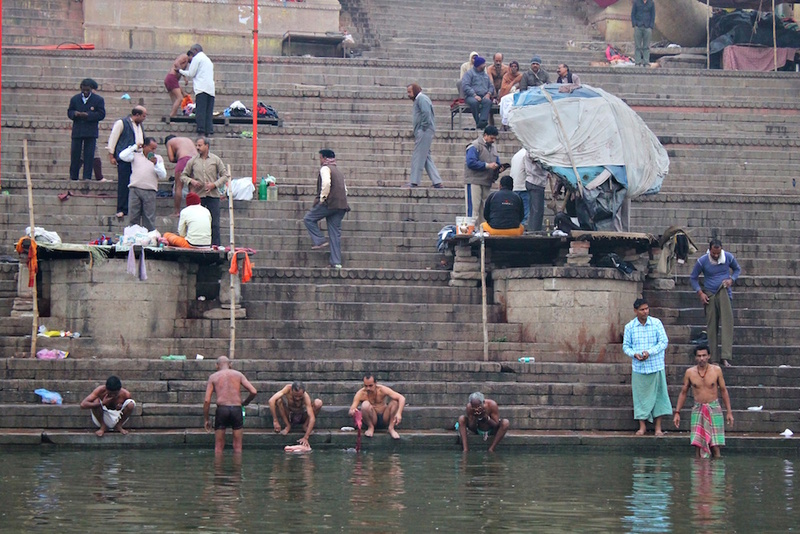 (I’m counting the two bathers further up on the ghats to get to the #9). 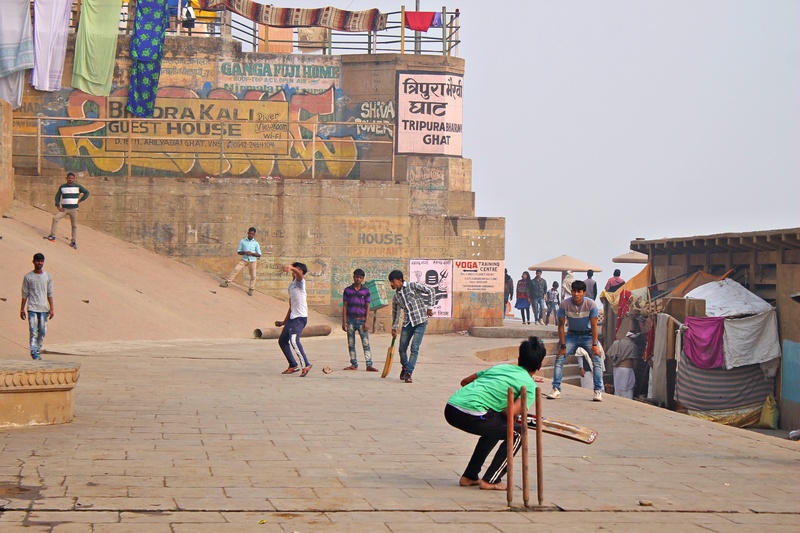 I can’t tell you how many times I saw kids playing cricket along the river. One guy even let me play catch with him briefly. 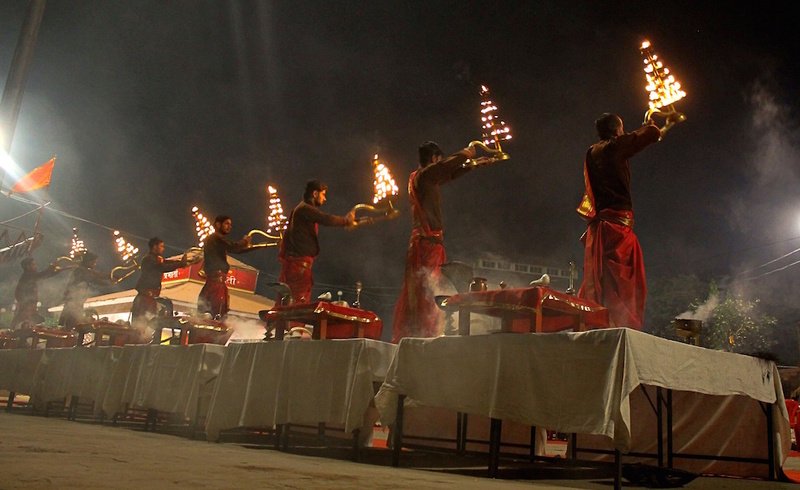 Aarti is performed in the evening as well as the morning. My first day in Varanasi I woke up at 4:45am in order to see the morning ritual, and I’m glad I did. The ritual was much more impressive up close. Cows are considered God-like in India. 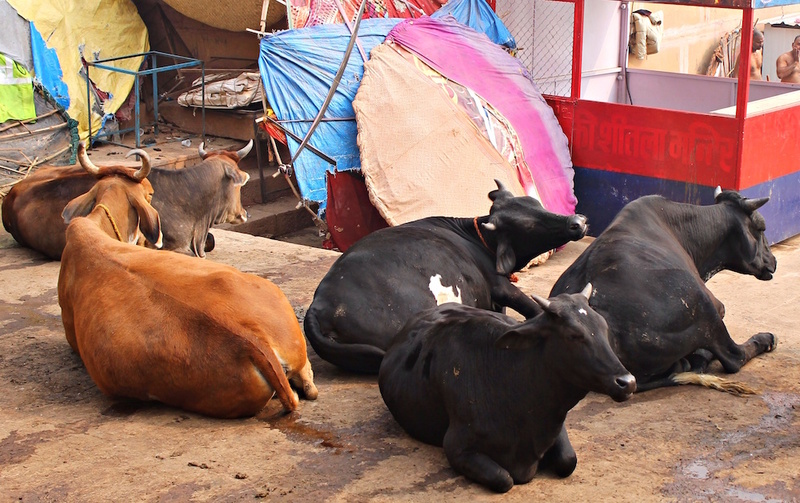 Beef and cow-killing is banned in many areas. Cows generally roam the streets (including walking with the cars). 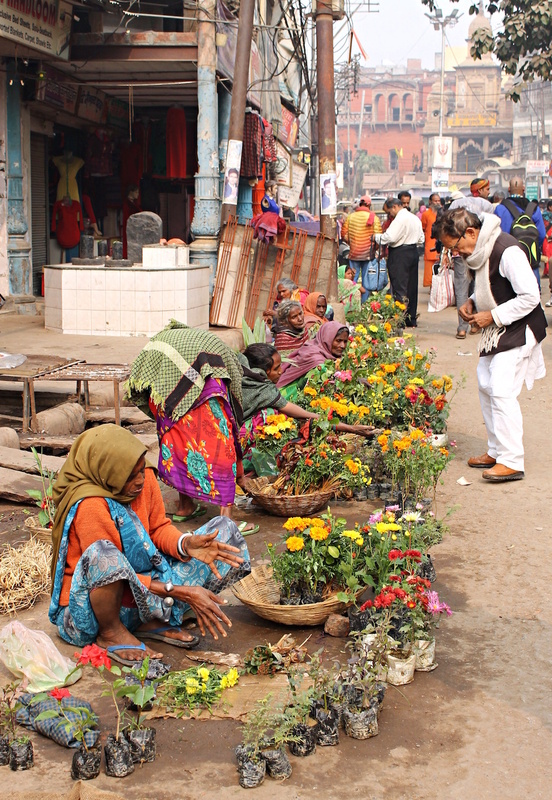 Here are some just sunning on the ghat. Sahus are religious ascetics/holy men. Their divinity is shown through their departure from material wealth and mainstream society in order to focus on the divine. They spend most of their time contemplating Brahman and meditating. Goats can also frequently be found wandering the city. 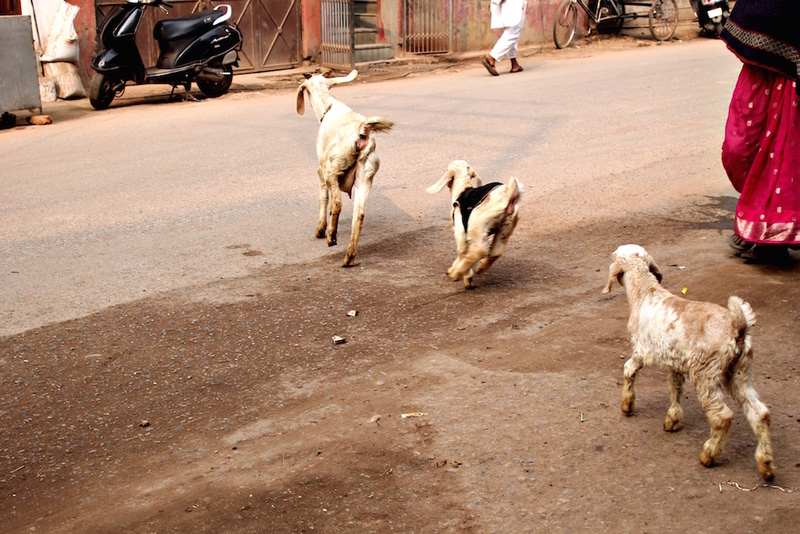 Like foreign tourists, the goats have similar trouble crossing the busy streets. This morning, a mother goat and her two kids took off during a brief lull in the cars and bikes. Only one kid made it to the other side. The other freaked out and ran back to the starting point. 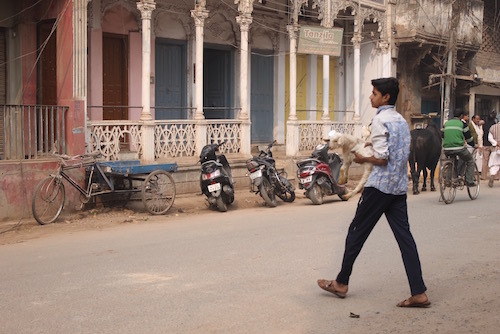 In a moment of true humanity, one of the vendors picked up the baby goat and walked it across the road back to its mother. These two kids paddled their boat along the Ganges to sell flowers to tourists and pilgrims for 10 rupees for a little cup (15 cents). People place flowers in the water as an offering. This morning I wandered around the old city, including the parts not frequented by tourists. 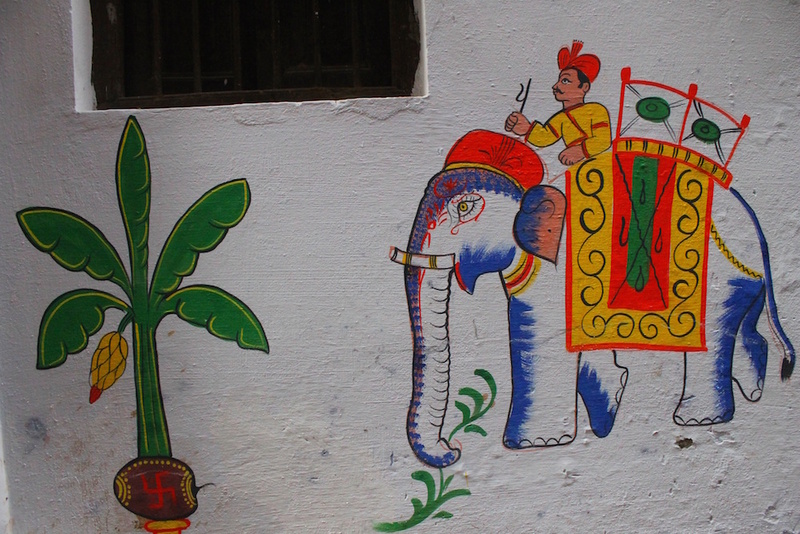 One of my favorite things about the little alleys was how decorated the doorways and walls could be, often with little elephants or flowers. Inspired! Thanks for an unusual rendition of this Christmas song! Esp. loved the 5 holy cows (will not have a hard time singing 5 golden rings)! I love the goat story! 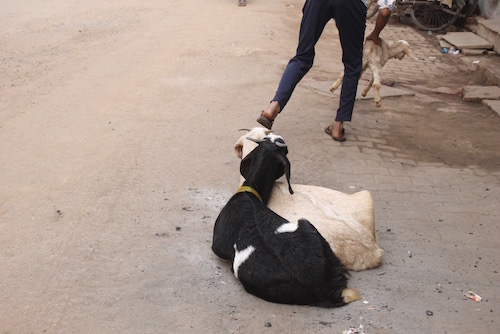 I have so many feelings about little goats in India. They get so obviously sad when separated from their mothers in the traffic and start crying. I’m not a huge animal person even but the little goats get me every time. very interesting story! How was the weather during Christmas? It was lovely! It’s not cold but not hot. I highly recommend it.